Whether you use shared, VPS or dedicated hosting, choosing the right content management system could make all the difference. There are several you can choose from with some available for free and others requiring a licensing fee. Choosing a content management system isn’t the easiest decision you will make. With the popularity of WordPress and it’s huge collection of plugins and themes, you may think it’s automatically the best choice. However, Joomla, Drupal or one of the many others may fit your specific needs better. A content management system or CMS provides an easy way for website owners to publish and manage content on their blog and website. Many blogs and news sites use content management systems. However, they have evolved quite a bit over the past few years making a CMS an asset just about every website can benefit from. 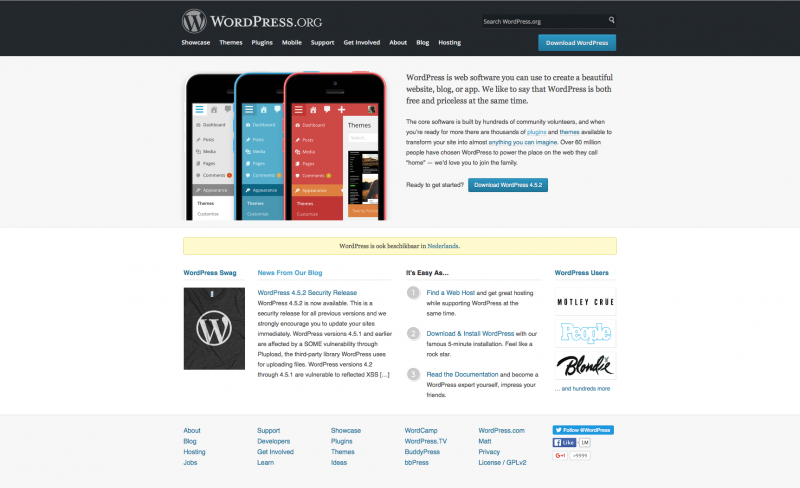 By far the most popular CMS you will find is WordPress. This CMS comes with a ton of plugins and themesyou can use free of charge, along with many premium WordPress themes for a small fee. WordPress is mainly a blogging platform, but it works great for websites and many other projects, as well. With the right plugins, you can use WordPress for just about anything. From an ecommerce website hosted on a dedicated server to a simple family blog hosted with shared hosting, WordPress works for all types of projects. WordPress only supports SQL and the most widely used choice is MySQL. It’s written in PHP, which makes it easy to use with just about any hosting plan. Running a WordPress site is very flexible and will allow you to use shared, VPS or dedicated server hosting. However, if you plan to see a large amount of daily traffic, you will want a dedicated server for your WordPress website. If you want to create a website/blog combination, WordPress is one of the most powerful ways to do it. This CMS also works great for building a static website, an ecommerce website, a forum and a number of other online applications. Another CMS used by many is called Joomla! This CMS provides a great choice for developers with more technical knowledge. It’s not nearly as user-friendly as WordPress. Just like WordPress, Joomla! is powered by PHP and supports SQL. However, it supports MySQL, MSSQL and PostgreSQL, while WordPress only supports MySQL. Joomla! comes with a number of extensions and templates you can use to customize your website. It’s a great choice for those looking to blog or build a website. There are even features perfect for this type of applications, such as RSS feeds and news flashes. For many websites owners, Joomla! is an excellent content management system choice. It will provide a more interactive experience compared to WordPress. However, it’s not as user-friendly or as widely used. If you don’t need to do much more than just run a blog and handle some multimedia content, Joomla! will do the trick. Drupal is known as one of the most comprehensive CMS choices on the market. It’s known as one of the top programmer’s platforms because it’s more than just a simple CMS script. Many programmers graduate from WordPress to Drupal when they outgrow the simpler script. This CMS provides a ton of functionality with advanced menu management, graphics modification tools, polls management and user management. 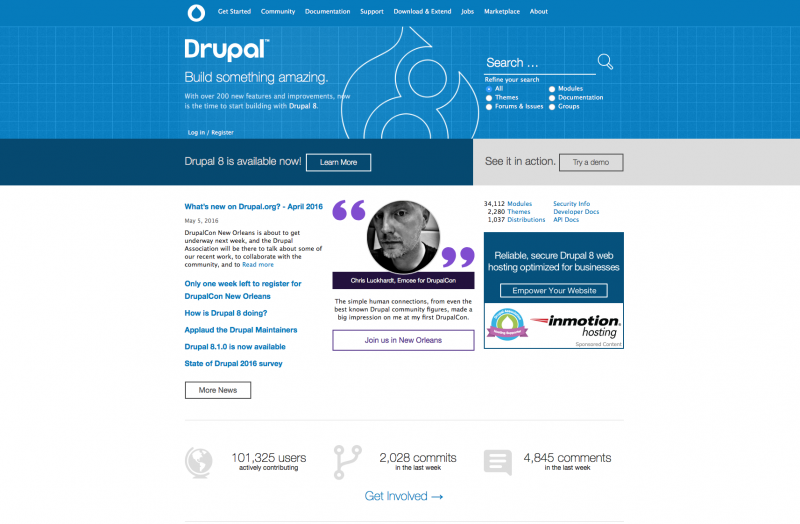 Drupal also comes with thousands of available plugins and you can create your own plugins. You can even create many different types of content including blogs, text, videos, statistics, podcasts, polls and more. The one main problem with Drupal is how user-friendly the system is. If you don’t have advanced knowledge, you may struggle to install and modify the script. It can be harder to use and comes with a steeper learning curve than WordPress or Joomla. Drupal doesn’t provide the efficiency or scalability of WordPress, either. If your site becomes very large, the script will generate a very large server load. For many, using Drupal means they will need a dedicated server to support growth and scalability. 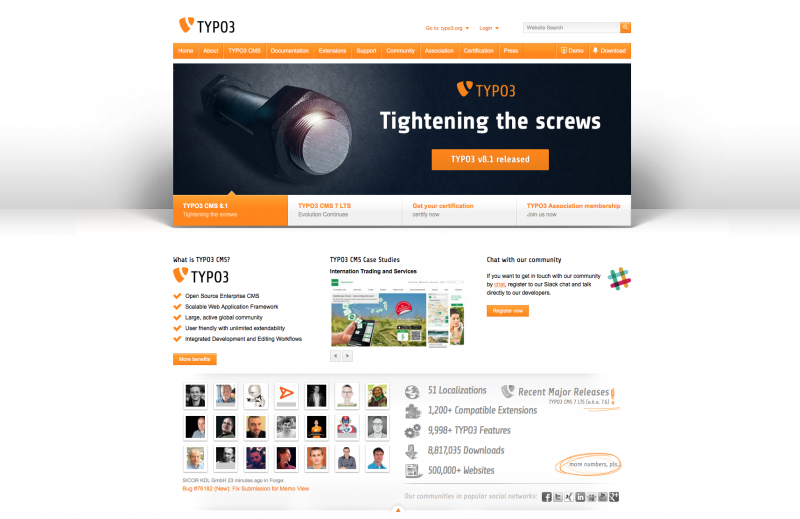 One of the more advanced CMS choices on the market is Typo3. It’s very powerful and an expanded choice with an Open Source script created by many advanced programmers. If you are looking for a highly comprehensive application with a ton of functionality, this may be the right CMS for your needs. Typo3 uses modularity and diversity, which makes it a great script for large news sites or company pages. It comes with the ability to use thousands of extensions to add functionality, such as ecommerce shopping carts, image galleries, discussion board and much more. This CMS provides a ton of control over content types, as well. You will be able to control the layout when it comes to adding tables, forms, images or even just text. However, Typo3 isn’t an easy system to install or set up. It has a very steep learning curve and it will take far more time to master than WordPress or Joomla!. It’s certainly not recommended for beginners. If you don’t have much programming knowledge, this CMS may be too advanced for you. Along with the difficulty of use, Typo3 uses up a large amount of resources to remain efficient. It can be a very good CMS for the right application, but you will need a dedicated server to really get the most out of it. An elegant, yet flexible CMS solution is found with ExpressionEngine. It works for many types of projects and it’s designed to be very extensive and easy for users to modify. Most users can pick up on how to use the backend of EE very fast. This CMS comes packed with features and even allows for management of multiple websites with just one installation. It’s a powerful tool for designers and provides custom SQL queries, along with built-in versioning. However, if you want to use ExpressionEngine, it comes with a price. Unlike WordPress, Joomla, Drupal and most other CMS choices, this is not an Open Source choice. 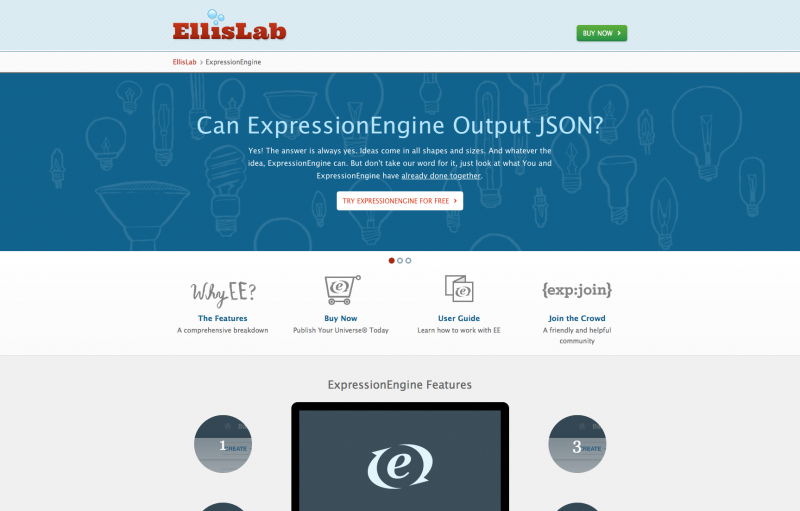 A personal license for ExpressionEngine is $99.95, while a commercial license is $249.99. Much like Quick.Cms, Cushy CMS is known as a very simple CMS to use. It doesn’t require the installation of software or any programming. The system can be set up in just a few minutes and its very search engine friendly. This is a hosted solution, so there are no upgrades or downloads to worry about. 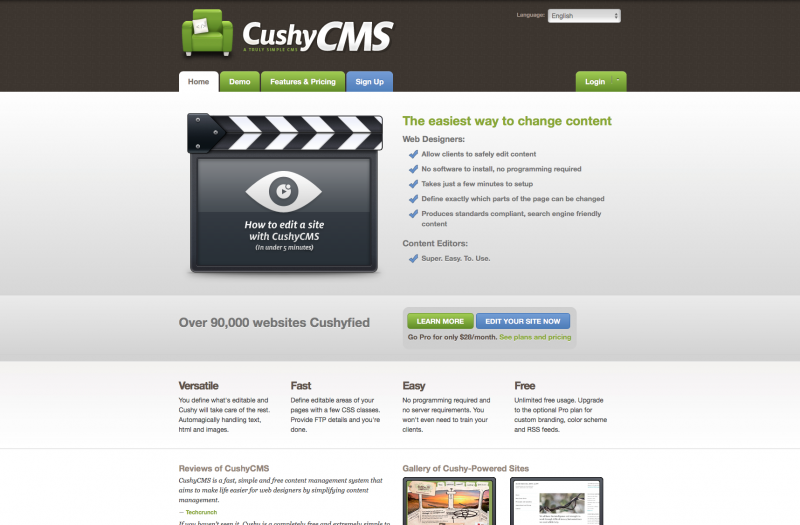 Cushy CMS is free for anybody to use and does have a pro account upgrade option. The pro account will allow you to use your own color scheme and logo, along with other customizations. The major drawback to Cushy CMS is that it is so simple. For many, it won’t provide the functionality necessary. However, for those just looking for a simple CMS choice, it might be the right choice. There are many other CMS choices out there. If you are on the hunt for the best content management system for your needs, those listed above are some of the top choices. Make sure you choose the right type of hosting for your CMS before you finalize your decision. Often, a VPS will allow you to get more out of your CMS and it will increase your overall website performance.